Motorola’s Moto G range was arguably the first premium entry-level smartphone, but other handsets are vying for its crown. The Moto G 2015 bumps up the specs and keeps an affordable price tag and while it’s not perfect, it’s definitely impressive. 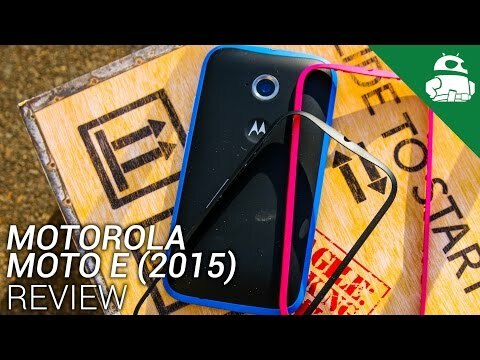 Motorola calls it the Moto G (3rd Generation), but we know it as the Moto G 2015. Whatever you call it, Motorola’s latest entry-level smartphone bumps up the features but keeps the affordable price tag. From additional durability to a more premium design, this year’s Moto G continues where the 2014 model left off. But can this budget device reign supreme as the best bang for your buck budget smartphone, or will it fall short this time around? We find that out, and much more, in our full review of the Motorola Moto G 2015! Editor’s note: Before we get into the full review, know that we reviewed the higher end model with 2GB of RAM and 16GB of on-board storage. Motorola also offers a less expensive model with 1GB of RAM and 8GB of storage. The design of the Moto G 2015 is almost identical to previous generations, but this year’s model does have a couple of tweaked elements. The addition of mid-plate detail delivers a more premium design, while the metallic accent around the camera (which can be customized) adds a bit of contrast. Of course, it wouldn’t be a Moto device without the all-too familiar dimple beneath the camera. While the Moto G’s design is meant to resemble the company’s higher-end offerings like the Moto X Style, don’t be fooled. The metallic accent that surrounds the device feels cheap and plasticky, which makes the device feel more affordable than premium. Moving around the sides, the power/standby button sits above the volume rocker on the right side of the device, while the top features a center-mounted 3.5mm headphone jack – a design element we’ve come to expect from Motorola devices. The left side of the device doesn’t sport any buttons whatsoever, and the bottom houses the Micro-USB port. Both the power and volume hardware buttons provide particularly poor tactile feedback; this is where the “budget” aspect of this device really shines through. Up front, we have a 5.0-inch LCD display with a single loudspeaker beneath it. Last year’s model featured two front facing speakers so the switch to a single speaker is a disappointment and while it’s not amazing, it certainly gets the job done. The other nice addition to the handset is a textured finish on the device’s back plate, which is great as it provides more grip when using the Moto G in your hand. The curved design of the rear helps ergonomically, but the rear cover causes an issue with a key feature on the handset: IPX7 certification. One of the biggest additions to the handset, IPX7 certification means it is somewhat resistant to water but the snap-on back cover design has the same issue faced by other waterproof handsets with removable covers (here’s looking at you, Samsung Galaxy S5). If you don’t secure the back cover on properly, you’ll find that water can get in underneath the device, and if it does cause water damage, you may find that this isn’t covered under your warranty. Motorola also decided to introduce the Moto G line to the Moto Maker program this time around, allowing users to fully customize their handsets online. You can customize the device’s front, back, accent color, storage/RAM configuration, and even add an engraving if you choose. Overall, the design and build aren’t as premium as we’ve seen on other low-cost handsets, but after all, it’s not all about design. To make up for it, Motorola has provided a way for consumers to make their handsets truly unique, and given that these customization features come at no extra cost, it’s definitely something we’d recommend doing. Motorola chose to include the same 5.0-inch IPS LCD display on this year’s handset that it did with last year’s, and unfortunately, it shows. While the bump up to a 5.0-inch display size will satisfy some, the decision to go with a 720p resolution is a disappointment. Obviously Motorola had to do this to keep the cost down, so just keep that in mind if you’re looking for a device with a Full HD resolution or higher. With 294 pixels per inch, the relatively low pixel density is very noticeable when viewing basically any type of media, and we question whether Motorola would have been better served offering a Full HD panel (while keeping the price tag affordable). The display also sports Gorilla Glass 3, which can protect the handset from scratches and fingerprints. The display seems solid enough to withstand a knock or two, as well. With that said, sunlight legibility and viewing angles are decidedly average. Given that other handsets like the Vodafone Smart Ultra 6 offer a Full HD panel (and are cheaper), the 720p resolution is certainly a disappointment. However, if Full HD is a must, be sure to check out the Moto X Play which is a more premium handset at a slightly higher price. What the new Moto G lacks in the display, it more than makes up for in its hardware and optimization. Under the hood, the biggest changes include a newer, better chipset and additional RAM (at least on the upper version). That’s right – Motorola has followed in the footsteps of other companies and offers different specs for different versions of the handset. The lower 8GB version comes with just 1GB RAM but the more premium edition offers double the storage and RAM at a slightly higher cost. Given you get around 11GB storage available on the 16GB version out of the box, we definitely recommend the extra storage and if you need, you can expand the storage on both versions using a microSD card. Although Motorola has included a removable back cover, the 2470mAh battery is non-removable. In case you’re worried about running out of juice, you’ll be happy to know that the Moto G 2015 delivers impressive battery life. The battery is a 400mAh upgrade over last year’s model and this definitely shows, with battery life around 16 to 18 hours with 5 hours of screen on time and two to three days of standby time. If you do run out of charge, however, the lack of quick charging means it takes over two hours to charge from full, so you’ll want to plan your charging accordingly. Overall, the hardware is what you might expect from a mid-range device. In actual use, though, the performance is definitely a surprise given the price tag. From mid-range hardware, you’d probably expect average performance, but the Moto G delivers so much more than this. The Moto G’s software is essentially a few additions away from a pure Android experience, and this shows when it comes to performance. From general multitasking to heavy gaming, this handset is more than capable of handling whatever you ask of it, despite the mid-range processor. Unlike other Android Lollipop-powered devices, we’ve not experienced any RAM management issues with the handset, and during the past week, we’ve noticed that even adding several apps and filling the storage doesn’t impact the responsiveness very much at all. Overall performance on the Moto G is certainly impressive, especially when considering the mid to low-end specs. For those lamenting over the lack of a cheap Nexus, the Moto G definitely delivers in this part. Despite the entry-level price tag, Motorola has included a large camera on the back of the device, and it’s the same Sony IMX214 sensor found in Google’s flagship Nexus 6. That gives you 13MP resolution, f/2.0 aperture and a dual-tone LED flash while an IR filter helps to reduce glare. There’s no optical image stabilization, however, meaning photos and videos can come out shaky if you don’t hold perfectly still. Just like on other Moto devices, the viewfinder is extremely simplistic here, which means you’ll need to download a third party application if you’d like to shoot with any extra filters or camera modes. Given the price tag, the camera is very impressive on paper and it delivers, as long as you have enough light in the scene. In daylight, the camera produces colors that are vibrant and captures an impressive amount of detail. In particular, HDR mode makes a big difference to images and while some other phones do very little in HDR mode, the Moto G does a really good job in lighting up shadows. The addition of a manual exposure slider is also really useful when capturing scenes with hot zones and lets you view the changes in the viewfinder as you change the setting. Daylight performance is definitely impressive, but sadly, as the sun drops so does the camera performance. Daylight images have very little noise but a lack of light results in focal problems and digital noise. And this camera captures SO. MUCH. NOISE. Given the price tag, the Moto G camera is definitely very impressive in daylight, but in low light conditions, this camera needs a lot of work. Unsurprisingly, the new Moto G features a near-pure Android experience, meaning you’ll have access to the Google Now launcher, with just a couple Motorola-specific apps thrown into the mix. The first of those, by the way, is Moto Display, which shows you waiting notifications or the time automatically when you pick the handset up or pull it out of your pocket. Moto Display is very useful when you consider how many people don’t carry a watch and check the time on their phone and it definitely helps improve the battery if you are one of them. Motorola’s suite of apps also includes Moto Assist, which lets you set custom behaviors for specific locations. As an example, if the phone detects you’re at the movies, it can automatically silence the ringer. Or if it detects you’re driving, it can automatically speak your messages to you and let you reply using your voice. These little tweaks are definitely useful as they help make the smartphone experience be what it should be – your phone, doing simple tasks automatically, so you don’t have to. By far my favorite feature is the number of different Quick Gestures, which let you accomplish simple things easily. A double flick of the wrist turns the flashlight on or off, while a double twist of the wrist launches the camera. This latter feature is a little too responsive for our liking, and often we’ve activated the camera just by picking up the phone from a table. The Moto G’s software experience, overall, is great. It’s responsive, easy to pick up for the first time, and allows the phone to runs as fast as ever. While none of the Moto-specific features are actually new this year, we’re very happy with the additions Motorola brought to the G line. Motorola calls this a $180 smartphone, but that’s not the version we reviewed. As noted above, we got the chance to review the higher end version with 2GB of RAM and 16GB of storage, which costs $219 from Motorola’s website. There’s also an entry-level handset that comes with 8GB of storage and 1GB of RAM, which is only being offered for $179. It should be noted that if you choose to engrave the handset, the price tag rises even higher than that. So, should you buy the Moto G? Well, it’s complicated. When the first Moto G launched, it introduced the concept of premium entry-level smartphones, but since then, plenty of handset makers have launched products that try to take the Moto G’s crown. On paper, the list of specifications isn’t the best you can get at this price point, but on the performance front, the Moto G is definitely up for the task. The many positives of this handset definitely outweigh the few and if you can handle the shortcomings in the display and camera, the Moto G is the one for you. With that said, we had a great experience with the higher end model. If you can, spring for that one. But if you’re trying to pinch as many pennies as possible, we’re sure the entry-level smartphone will do just fine in your pocket.